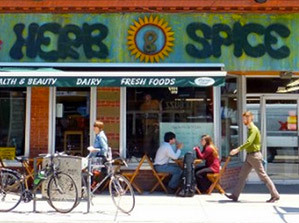 The Herb & Spice Shop on Bank Street is rooted in Centertown’s desire for healthy, natural and organic food. Growing with the neighborhood, the store has been open for over 30 years, actively supporting local producers in and around the Ottawa area. With fresh organic produce delivered daily, an array of deli and grocery products as well as an extensive bulk selection, including a large variety of culinary and medicinal herbs, the Herb & Spice Food Shop caters to the needs and diets of everyone in the community. Whether you are vegetarian, vegan, gluten-free, a raw foodist, or simply someone who enjoys good food, it is our goal at the Herb to provide you with something tasty and nutritious to eat in a friendly and down-to earth environment. We’re open ‘til 9 every night!